Stretch Marks are one of the things I fear the most about pregnancy! When I was pregnant with Josselyn I prayed every night for 2 things. #1 that I would not get stretch marks & #2 that I would not have to get an episiotmoy/or tear. Well, unfortunately only one of my two prayers were answered. However, I did go through 9 months of pregnancy and NOT get a single stretch mark (the episitomy/tearing is a whole other story). It is pretty amazing that I managed to stay strech mark free becasue I definitely gained a good 28 lbs during my pregnancy & my stomach went from flat as a board to huge as a beach ball! I am not completely sure how to avoid those retched marks again but I am hoping & praying that I somehow do! There are tons of mixed tales & stories on stretch marks. Some people say that there is absolutely nothing you can do to prevent stretch marks becasue they are genetic. I have read things & heard people say, if your mother had them you will have them, if your mother did not have them then you will not have them. My mom informed me that she stayed stretch mark free with her first 2 pregnancies however with her 3rd pregnancy she was left with a couple battle wounds (AKA stretch marks). I hope the genetic thing is the main factor because I absolutely do not want to birth another child out of my ____ (fill in the blank) after this one! I thought one time was enough and somehow I am doing it a second time! I can promise you that there will not be a 3rd biological child coming from me. Honestly, if John would've let me use a surrogate mother I would have been all for that for both pregnancies (seriously!) 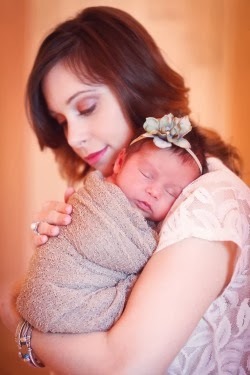 I absolutely adore the outcome of the pregnancy (the sweet baby) but I despise the 9 month process along the way. That may sound heartless, but oh well. Just because I am not a fan of pregnancy does not mean that I am not eternally grateful & thankful for my sweet baby blessings. Not everyone has to love pregnancy ladies, but luckily many of you do! Anyways, back to stretch marks...I have heard you can help prevent stretch marks by not scratching your tummy, even when it itches! I have also heard to avoid reaching high because a sudden reach & pull can cause them. Many people have recommended drinking tons of water (1/2 a gallon a day) that keeps you hydrated from the inside out plus it is very healthy for both mommy & baby! I have had freinds say that their doctors said steady, healthy, weight gain can help avid them. Online I read not to scrub your tummy in the shower too hard or dry too roughly with a towel because both of those things can contribute to them (hmmm?). Lastly, I have heard that if you douse yourself with Palmers Cocoa Butter (or some other cream) every day then your skin will not get dry and you will have a good chance of avoiding stretch marks. My last pregnancy I used Cocoa Butter religiously and in the end I had no stretch marks! Needless to say, I am definitely going to do the exact same thing this time around. In fact I just bought my 1st bottle of Cocoa Butter last week! I have already began to rub it all over at least once a day. Whether or not it really helps doesn't matter to me (I am not taking any chances). I have also read about & heard of some others good preventative creams like: Vitamin E oil, Bio-oil, Bump Gloss, Clarins Tonic Body oil, Olive oil, etc. Who knows if those creams work but there are definitely some experienced mama's out there who swear by them! Well, for now I am going to stick to using my Palmer's Cocoa Butter daily, drinking lots of water and hope/pray for the best! 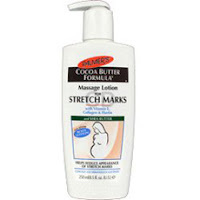 If you have any other tips on how to avoid stretch marks feel free to let me know. I am always open to trying new things; I have nothing to lose! Here are some pics of the growing bump!